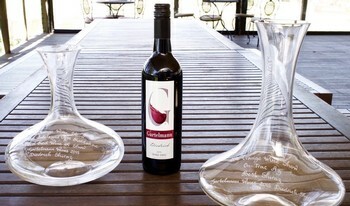 Gartelmann Wines has released two new vintage wines from its NSW Central Ranges portfolio; the 2013 Gartelmann ‘Jesse’ Shiraz ($30) and their Bordeaux blend, the 2013 Gartelmann ‘Phillip Alexander’ ($25). Both wines are from NSW’s Mudgee region. Vignerons, Jorg and Jan Gartelmann have been traversing the NSW Central Ranges over the past few years, discovering vineyards and growers that have a similar approach to wine growing. We were looking for small, like-minded growers with varieties that are eminently suited to their particular region. The 2013 Gartelmann ‘Phillip Alexander’ is a blend of Merlot, Cabernet Sauvignon and Petit Verdot. The grapes are from a vineyard situated at Rylstone, a sub region of Mudgee, at an elevation of 630 metres. This is a fantastic vineyard. It is located on a sloping block with reddish-brown clay loam mixed with sandstone and pebbles. This provides perfect drainage and mineral input for the vines. The elevation ensures a slightly cooler growing season to Mudgee, which works well for these varieties. The 2013 Gartelmann ‘Jesse’ Shiraz is from well established, 68 year-old vineyards in the traditional growing region of Mudgee. Due to the relative proximity between Mudgee and its coastal neighbour Hunter Valley, their Shiraz are often compared. Mudgee’s inland climate is drier and tends to producer riper flavoured shiraz, whilst the elevation gives the wines higher acidity than our Hunter versions. As a rule, Mudgee experiences less rainfall and humidity than the Hunter Valley. The nights are cooler and there are more instances of spring frosts, however there are a higher number of sunshine hours. Vintage is usually around four weeks or so later. The Mudgee Shiraz was matured in new and one to three year-old puncheons and hogsheads for 18 months to develop structure and complexity to match the tannins and acidity whilst allowing the regional fruit to shine.